» Will dog park cancel Albany rally? Will dog park cancel Albany rally? The dog park fence is still unfinished, waiting for gates that may be installed next week. Albany’s first fenced dog park is taking shape, but not without controversy. A representative of the Northwest branch of the Familiy Motor Coach Association has complained to the city that the dog park takes up space the association had used to park 100 motor homes during its rallies at the Linn County Fair and Expo Center. He implied that the dog park jeopardized holding future rallies in Albany. 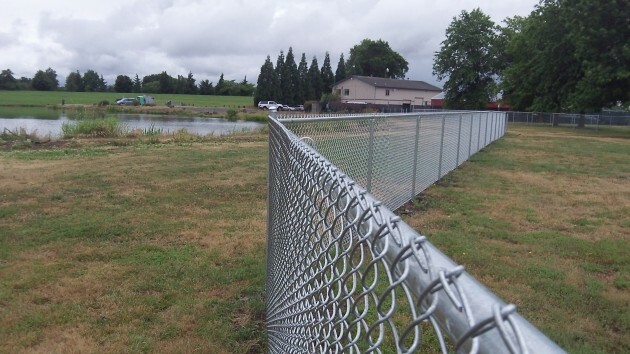 A contractor for the Albany Parks Department has been installing the dog park fencing on the north side of Timber Linn Park. 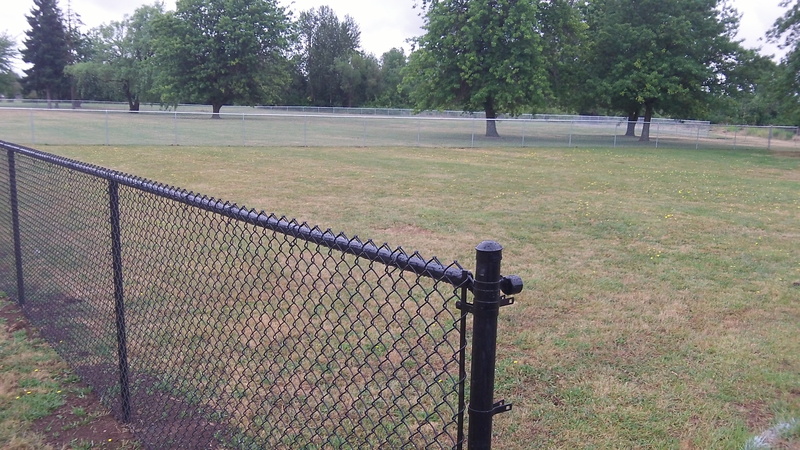 Parks Director Ed Hodney says the contractor, University Fence, is waiting for a delivery of gates to finish the job, which is expected to happen next Wednesday. According to him, the contract amount was $24,000, the lowest of three bids and substantially below his previous estimate that the fencing would cost around $40,000. The fencing put up so far appears to create two separate areas, one bigger than the other. Hodney told the city council Wednesday that one area will be for small dogs, the other one for big ones. In either one, owners can let their dogs run off leash. The back fence of the dog area is near Timber Lake. The dog area is directly across S.E. Dogwood Avenue from the graveled portion of the parking lot of the Linn County Fair and Expo Center. The motor home complaint surfaced at the city council meeting Wednesday, when Councilor Rich Kellum said Linn County had not been informed of plans for the dog park fencing ahead of time. Hodney agreed with Kellum that communication between his department and the Expo Center on the dog park issue could have been better. But he also said the fenced area takes up only two acres of a 12-acre section of the park, leaving 10 acres still available for parking if needed. In a letter to Mayor Sharon Konopa and Hodney, Andy Balogh of the motor coach association said he had noticed the fencing when he went to the Expo Center to work out a “multiyear contract” to hold rallies there. “With the loss of this parking area, it has now become a challenge to sell to the Northwest Area Executive Board and our members a reason to return to Albany for out Northwest Rally,” Balogh wrote. He added that the rallies mean $1.5 million to the economy where they are held. Expo Manager Randy Porter said today (June 26) that no decision about scheduling a motor home rally at the center has been made. Never mind that “actions speak louder than words”. If you spend another $200,000 to promote more use of the Expo Center while actively working to detract from its viablility, it will certainly be money well spent (sarc). Yeah, a little more/better communication might be a good idea. I just checked the Family Motor Coach Association website and it looks like they have had three conventions in Oregon since the 1960’s, with a 4th scheduled in August. in Redmond, where they have met the last 2 times. I would think, like Stephen, that an accessible dog park could indeed be an amenity draw for those that travel in. On the other side of the coin, I’m sure that businesses associated with RV folks are a major component at an event like this with sales and displays. One question might be to determine the space needed for drive-in visitors versus displays of RV’s for sale, and what gets located where. City owned Timber Linn Park is a great amenity to have near the county owned Expo complex. But Timber Linn is also a daily use facility for the people of Albany and the surrounding area. Mr. Beesons comments about “actively working to detract” from the viability of the Expo center seems to imply that the Expo center trumps the daily needs of Albany taxpayers. My understanding is that the Linn County Commissioners have long had the ability to increase funding to the Expo center and tourism marketing by imposing a county transient tax, but have steadfastly refused to do so. Of course, the RV folks would pay no transient tax living in their own RV’s. Might not visit many restaurants either. So how long has Roger been chair? If the Expo center is in a bad way it has been his singular lack of problem solving that has let it happen. My comments on this issue were promopted by the clear implication of the FMCA representative that the decrease in available property would hurt the chances of holding their event at the Expo Center. Point is that the City of Albany staff’s opinion about what is needed by an event is irrelevant – the event manager’s decide what is necessary based on their needs. Every time the potential host facility cuts back on available options they decrease their chances of obtaining that event. That means that Albany is considering increasing spending on marketing the Expo Center on one hand while restricting the potential benefit of doing so on the other hand by reducing the facility’s capability. And RV events attract a significant number of people who do use motels and restaurants – vendors, staff, etc. And as far as a county room tax goes, I say go for it – almost all of the rooms in the county are in Albany anyway.